A land shark is a reference to a 1970’s Saturday Night Live skit. According to Wikipedia it’s also a term that used to be used for real-estate speculators, German Shepherds and a beer by Busch called “Land Shark Lager.” The Land Shark skit from SNL used to be pretty much the same each time but it was funny regardless. The set up was a knock on the door. The land shark would try to gain entry by claiming to be a delivery person of some type, like a singing telegram. Here is a video link to one of the skits with Gilda. I do like that some of the characters in the game, you wouldn’t normally associate with their element. They usually turn out to be some kind of in joke or pun though. 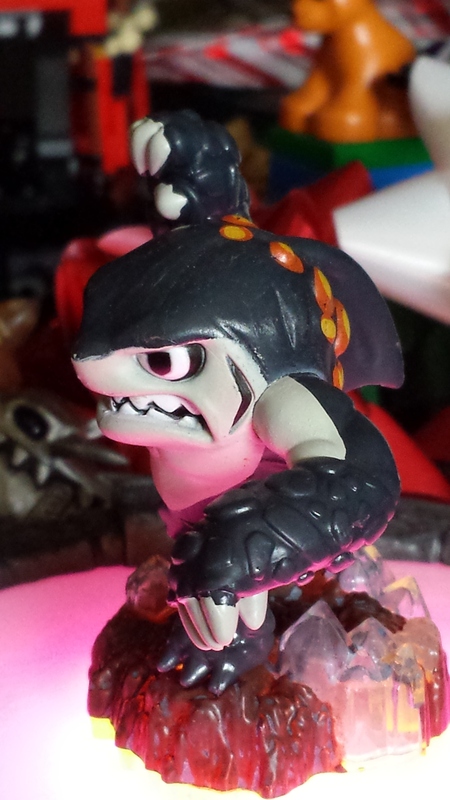 On the other side of the coin, Terrafin is a great character to play. He has two attacks. One is punching and the other he dives under the ground, swimming like a shark. When he pops back up he can slam the earth causing collateral damage to multiple targets around him. There was one part of his character I don’t like. He makes this one random comment “Where’s my five dollars?” He only makes it when he’s collecting money as treasure but it struck both me and Kane as a little offensive sounding. You have to hear it to know what we are talking about. I can see that some people are talking about this on the internet. Maybe I’m just being overly sensitive but until I heard that quip, I thought he was one of the best characters in the game. It just offended me the way that line comes off. It presents itself as racist. There really aren’t races in this game but outside of the context in the real world you brain picks up on the racist nature of this one voice acted comment. He is part of the brown, earth faction and he is hitting you up for money. The accent is a stereotyped black accent. It’s very upsetting. According to Youtube he’s actually a very popular character. Maybe I am making to much of this one comment. If anything, they just weren’t thinking about it when they recorded it… I hope. 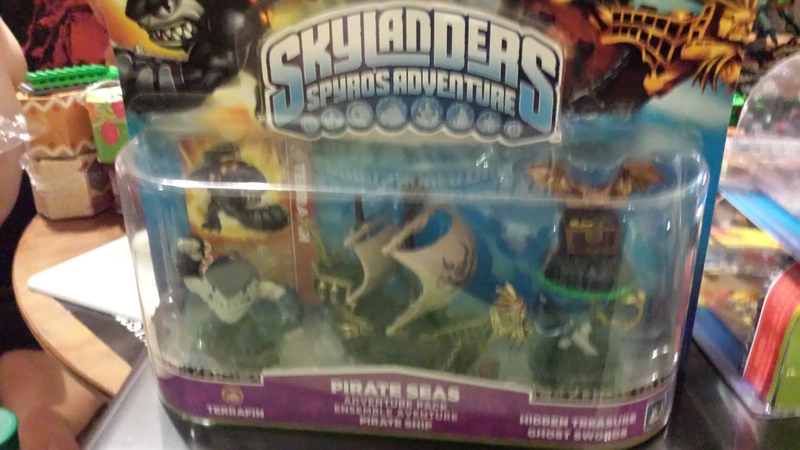 The original, first version of him comes with Skylanders: Spyro’s Adventure in a package with the Pirate Ship, a treasure chest and pirate swords. The pack gives you a new level to explore, a huge magical attack, a weapon and a hidden treasure. The package is $24.99 at most places. Right now Toys R Us has a buy, get 40% off deal going. The price is worth it for the added content. 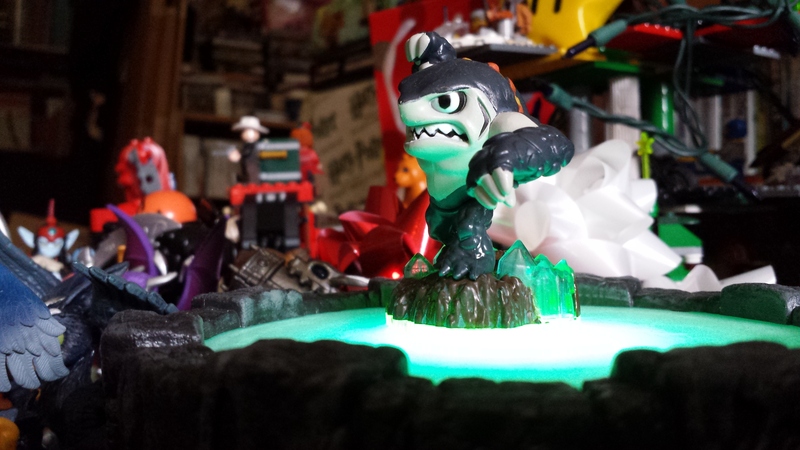 They do have another version of him that comes with GIANT METAL KNUCKLES. So, we will see what happens with the game and if we keep playing past Giants.